A group of 75 protestors occupied the St. Louis Police police department headquarters earlier this evening. The protesters marched through the city and then congregated in front of the headquarters where they demanded that all those "occupying the department" be removed. 18 protesters were arrested (many for obstruction of traffic because they were laying in the street and throwing things), but not before they posted notices and read their list of demands to police officers who stood out front, using pepper spray to make sure the protesters remained outside. 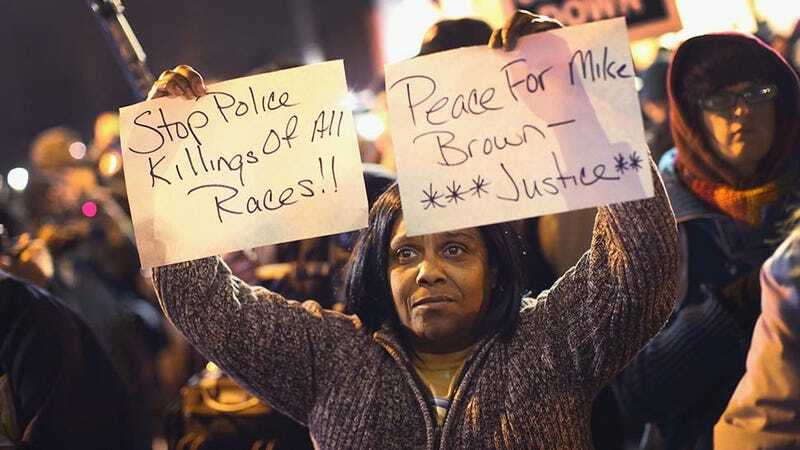 The protesters planned to stay in front of the station for four hours to " represent the hours that Michael Brown's body lay in the street," according to KMOV who were on the scene. Five protesters were able to enter the building. A man who got behind the barricades but was apparently opposed to the protests and supporting the police was also arrested. A tweeted photo of notice of eviction alleged to be one of those at the scene calls for the eviction of Chief Sam Dotson and his colleagues for reasons including police brutality, mass incarceration of minorities and failure to train officers in cultural sensitivity among others. A police rally will be held January 1st at 2pm.